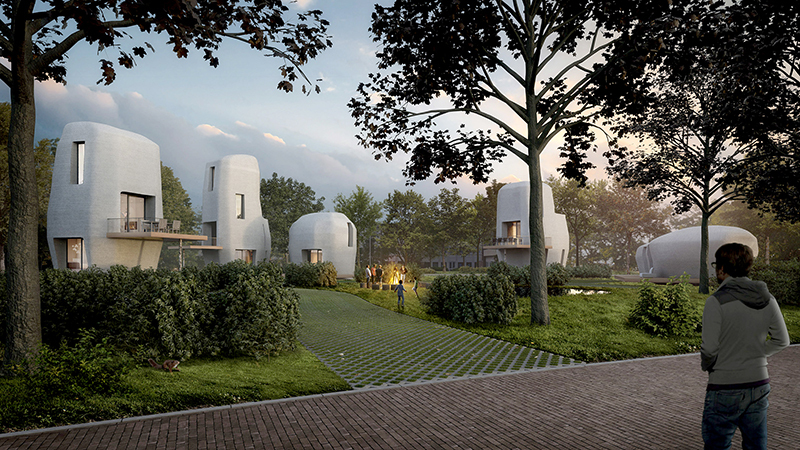 An artist impression of the planned 3D concrete houses. By this time next year a town in The Netherlands, Eindhoven, will have its first few 3D printed homes built and ready for people to live in. There are a few companies working together with Eindhoven University of Technology and the local municipality on Project Milestone. 3D concrete printing has the potential to drastically change construction in terms of sustainability, affordability, speed and freedom of form and choice, according to the university. “This is a world first for a commercial building project that is using the 3D-concrete building method” according to the University. As these homes will be lived in, they will have to comply with the applicable local building regulations as well as the requirements of residents when it comes to layout, comfort, quality and affordability. The first house will be a single-storey, three-bedroom bungalow. Four multi-level homes will follow this one on a site that has been earmarked in the south of The Netherlands west of Eindhoven, near the airport. Elements of the first single story three bedroomed house will be built off site and transported to the building site, the remainder will be multi-level and built in situ one by one. This will give the team the opportunity to analyze and learn as they go. If all goes according to plan the first tenants should be able to move into the first 3D printed house in mid-2019.